seating 600 folks…that’s a mighty big heap o’ chairs. sticking to our grit & GLaMOUR theme, we opted against the standard rental slipcovers and decided to keep it simple. and rather than a VIP section, we opted for a VIP TRAiLER CouRT using our newly gypsy-fide AiRSTREAM. we added a hodge-podge of fleamarket rugs, cowhides, retro metal chairs, and TONS o’ candles. and inside, the coolest gypsy-vibe-room ever. 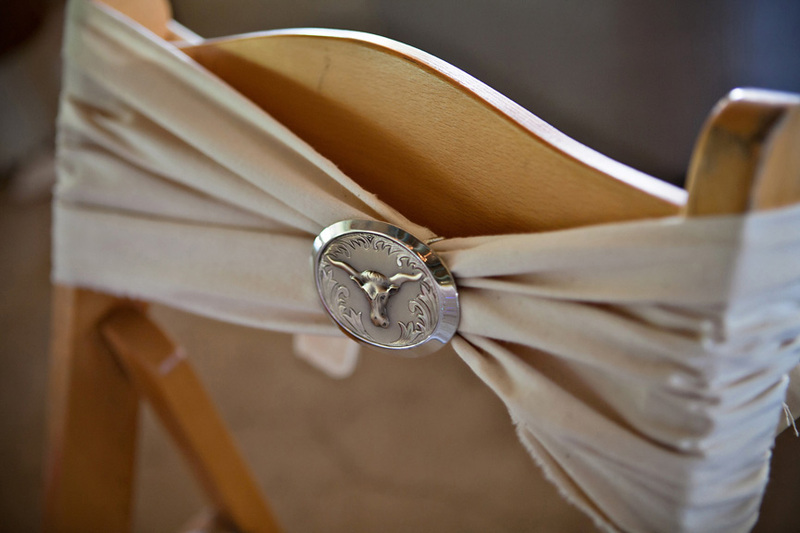 for some of the chairs we created a custom design just for the occasion and had it crafted into chair slipbacks…. a trophy buck, hunting, guns, and randy travis’s song, forever & ever amen (because according to CrAZY LEgS, NOTHING says ‘i love you’ like crossed pistols and a dead deer :))….with baroque details, ornate scrolls, and prairie-colored roses. the design was printed on canvas and sewn to fit the chairs (the chairs actually ended up about an inch bigger than our initial measurements, but we work on the fly so with a little stretching, we made it work:)). 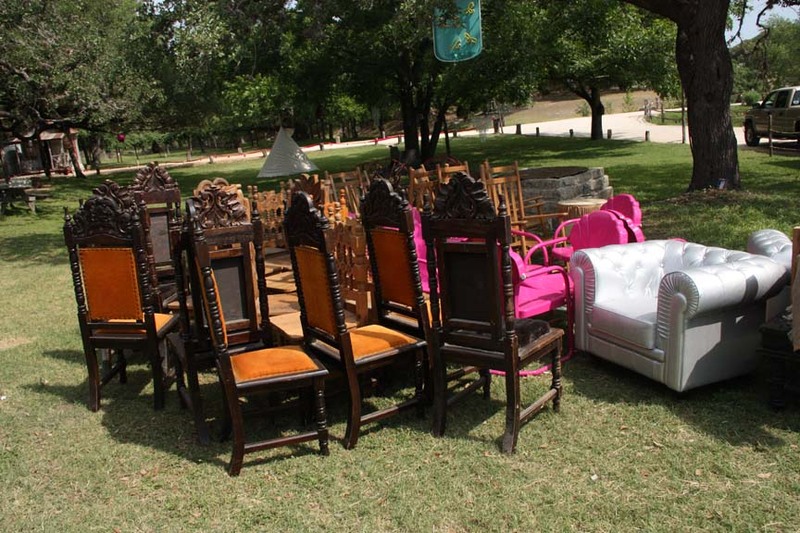 we tied floppy hot pink satin sashes on each chair for a pop of hollywood honkytonk and they were perfect. 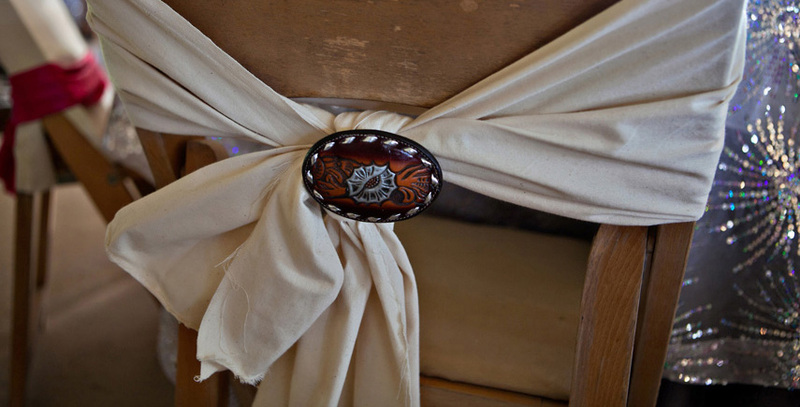 for other chairs, we wrapped ripped pieces of canvas around the backs and then tied them off with vintage belt buckles and die cast cap guns. 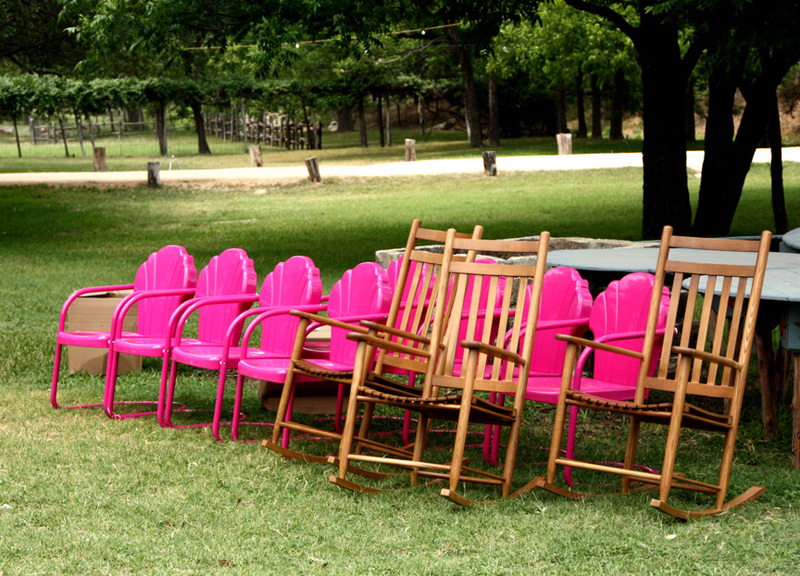 old style granny rocking chairs & retro metal HoT PinK chairs…. 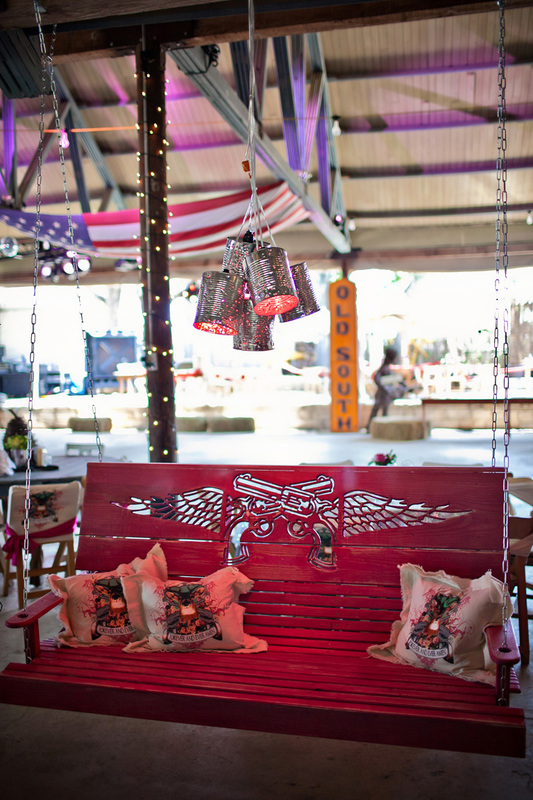 the retro metal chairs sat in front of the AiRSTREAM that served as the ViP trailer court…we placed the rocking chairs on the porch of the barn (for a great view overlooking the creek). LOVE IT! The pink chairs are hot. 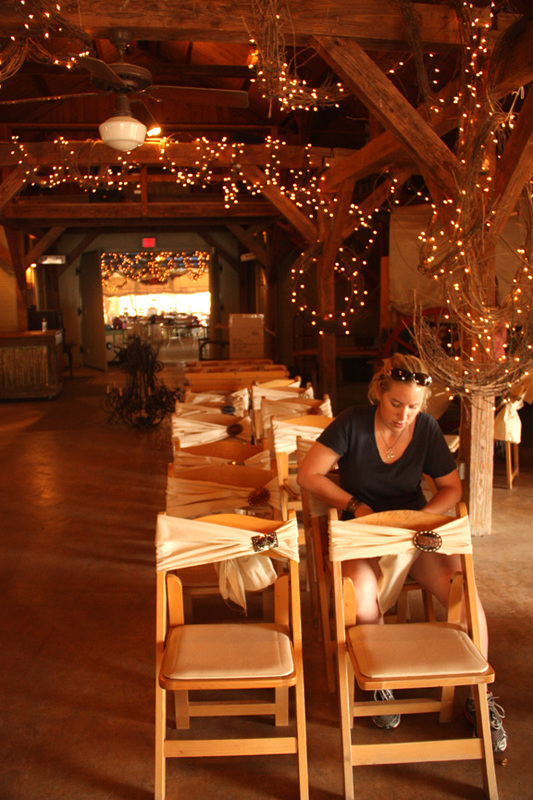 The barn lighting and canvas slipcovers are my favorite. This is what a reception should be … PERSONALITY. thanks jennifer!!! we agree! and with the dynamic personalities of blake and miranda, it was easy to blend into the reception decor! Ah-mazing, I love all of it! You ladies really are the junkiest! Fabulous. Love the whole thing. I think you should sell the Forever and Ever design as T shirts. thanks for the suggestion, mary!!! we’ve actually been tossing that idea around soooo we may have to just do it! XOOXOXXO! Love it all! Love the powder-coat color on metal chairs! So in love with the whole design! Amazing!!!! Is the silver sofa for sale?????? I just bought 8 chairs exactly like the head table chairs! I pestered my husband and the sellers for 5 months. They will grace our huge custom outdoor table under a big oak tree after a refinish. Love them!!!!!! great buy!!! we LOVE our gothic chairs and never wanna sell ’em! thanks for reading!!! LOVE…LOVE it all!!! In fact, I don’t know what is my favorite as it is all just plain ole AWESOME!!!! 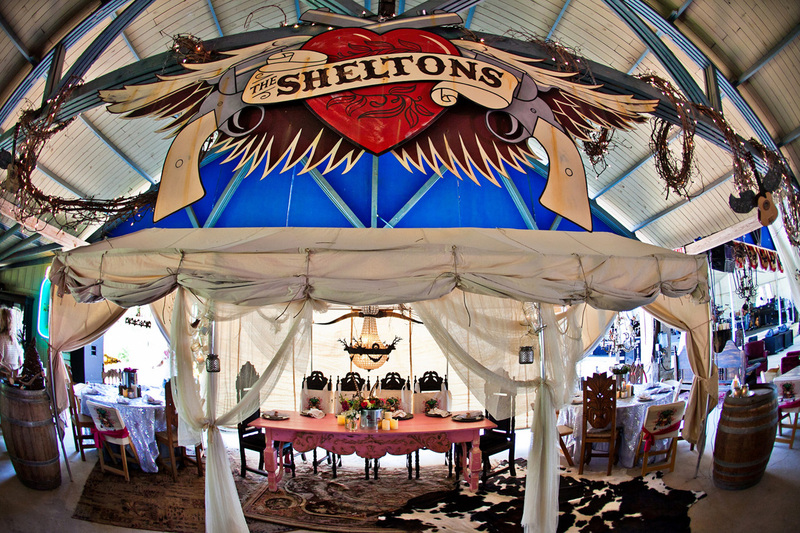 Make me want to get married all over again……” Gypsy Style”!!! 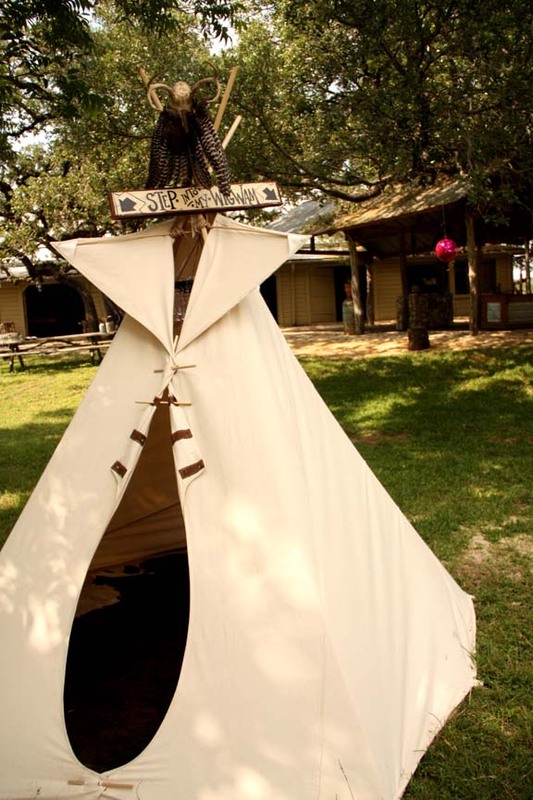 I do really think ya’ll should write a book……Junk Gypsy style weddings and more!!!! What was this event? No idea? 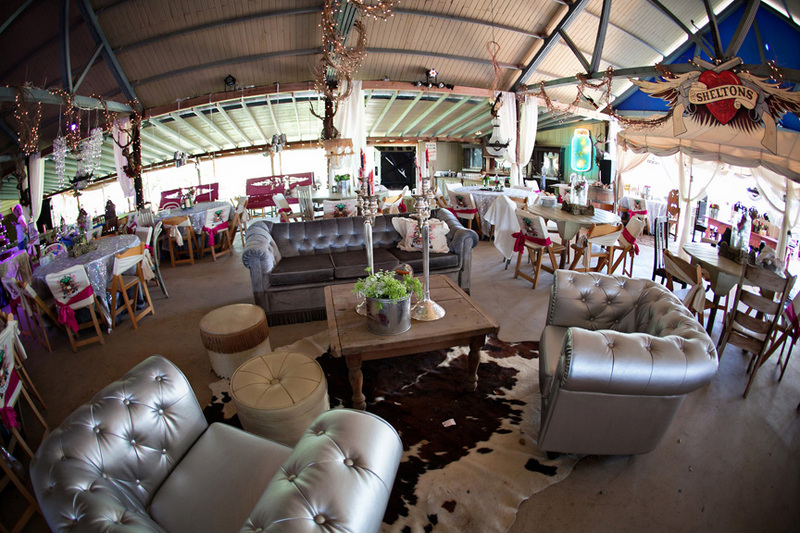 Loving the silver chairs…and the print on canvas…and the tipi…sigh…Love it all! LOVE it all, thank you for sharing your amazing creativity and details with us!!! thanks so much ranch sista!!! and welcome to the world, baby foal! XOOXO! Too bad I was married nearly 25 years ago – I would of totally loved this theme! Such an inspiration for all those brides to be out there!! thanks sooo much annie! glad you’re diggin the style! hmmm….maybe you should have an anniversary party?! Holy CoW!! I love that trailer so much I want to scream!! 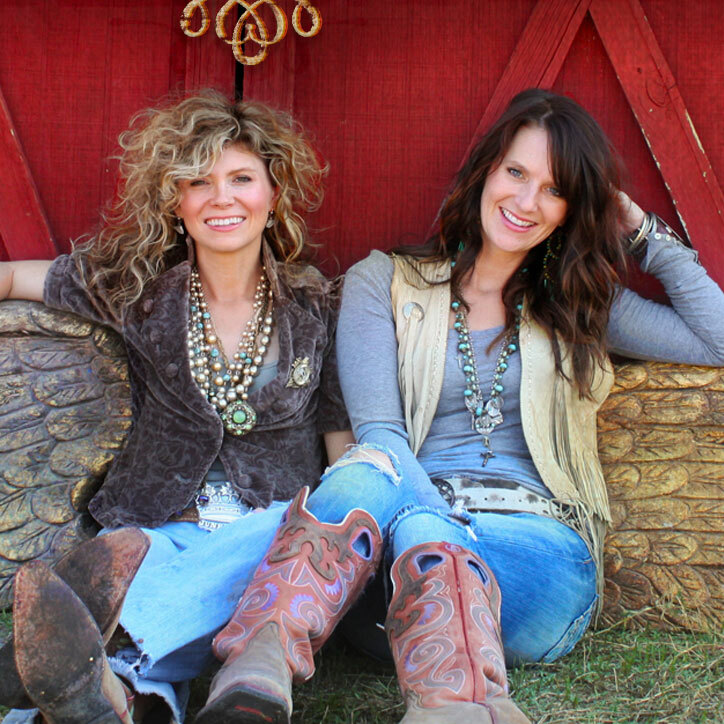 On my bucket list: get my own mini travel trailer and run away to travel with Sisters on the Fly. 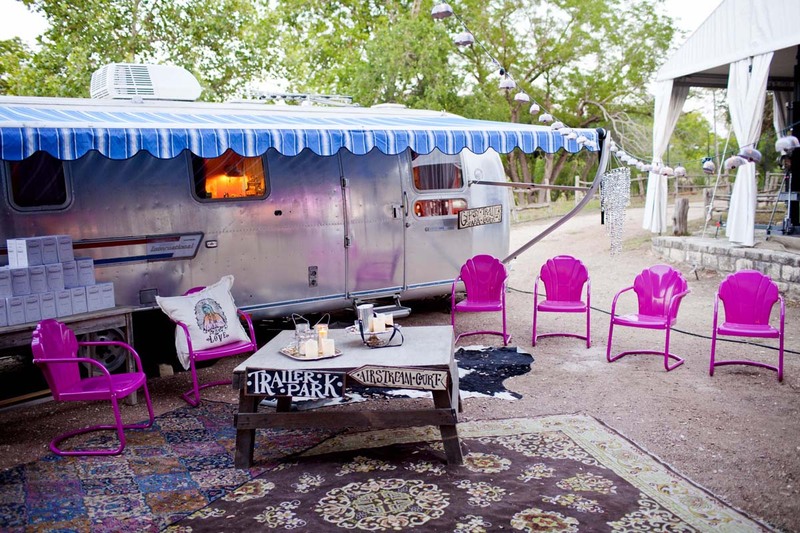 http://www.sistersonthefly.com Bucket list #2… have Junk Gypsy diva’s decorate it for me. absolutelt one if the most imaginative, beautiful thinds i’ve ever seen!!!!!! just amazing! 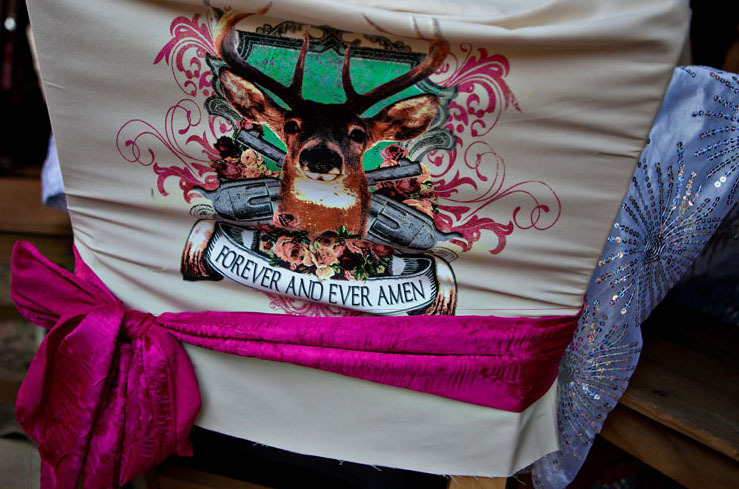 Okay, I “ditto” the tee shirt idea with the deer and Forever and Ever Amen design. Men’s L, please! 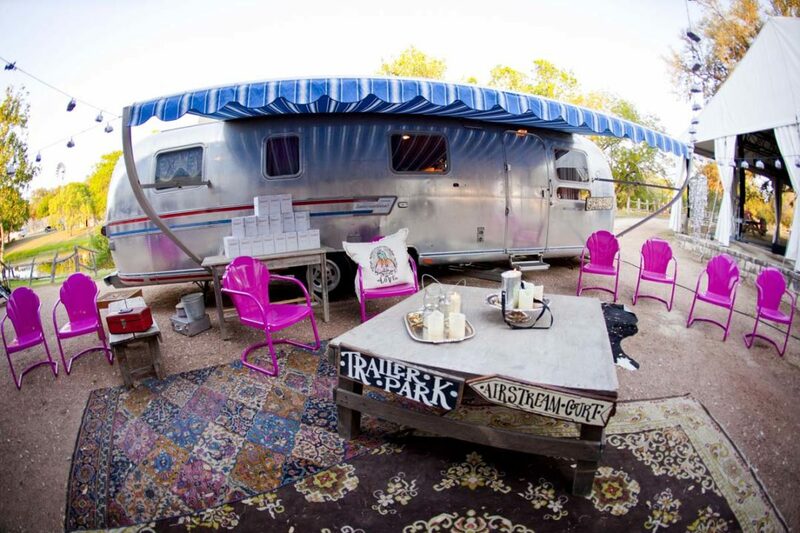 AND, when do we get to see inside the Gypsy Airstream? JG, you rock my sox! 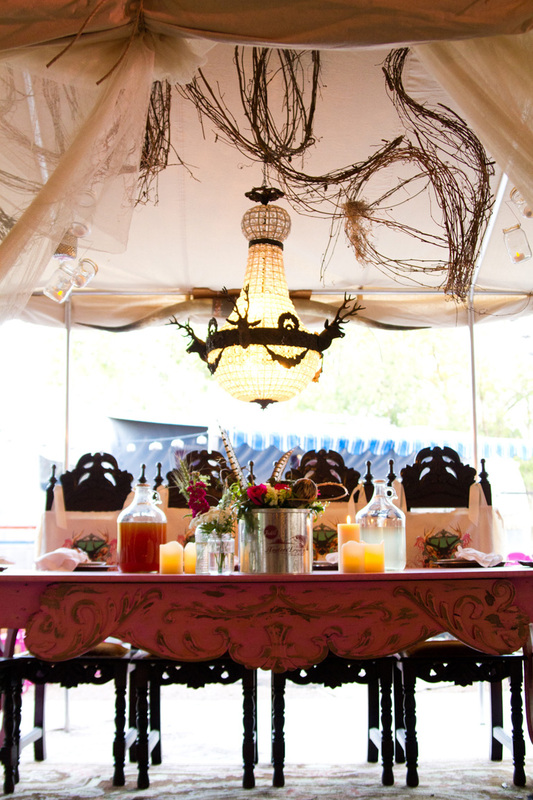 The pink swings are amazing along with the rest of the decor! I would love to send Miranda some of the lace denim skirts I make by Wedding Belle Blues. Would you be able to contact her for me? I dont think you could have done anything any different or any better that would represent Blake & Miranda they way you did. AWESOME work! Over the top cool! I love it all! I am sure you will be busy planning another star studded wedding real soon!! I think I am in LOVE with the swings!! I want one !!! Ahhhhh!!!! So stinkin cute! You really know how to throw a faBulOus Party! I know everyone had a ball with you! Miranda and Blake are lucky to have you fro friends, I am too ! I love every thing about this!! I am decorating my whole house based on this!! LOVE. LOVE, LOVE!!! LOVE IT! From top to bottom and inside out! You ladies ROCK and I am so proud of you! GREAT job, not that I am the least bit surprised! Congrats on a FABULOUS, incredible and very inspiring wedding! I absolutely LOVE this. Still waiting to find my country boy! And I love the airstream. My parents sold their camper a few years ago and I miss camping so much. Love you guys! I just saw Miranda at CMAC in Canandaguia, NY. Loved the concert. 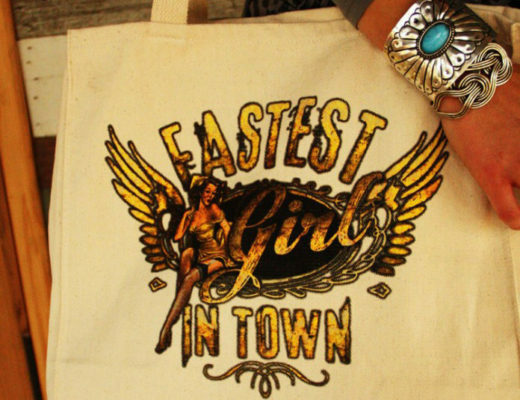 Can’t wait to see her again and get the Pistol Annies CD. Just wanted to say hi! You are the only other person that I have found that spells ReaJeania this way! Beautiful! I can almost feel the texture of the chairs and see the light coming from the lamps, everything looks so vivid! Miranda has become such an inspiration to show girls like me thats it’s beautiful to be yourself! Where did you get the pink metal chairs? I need me some..please!!! Thanks. As always you girls are Rocking it out! 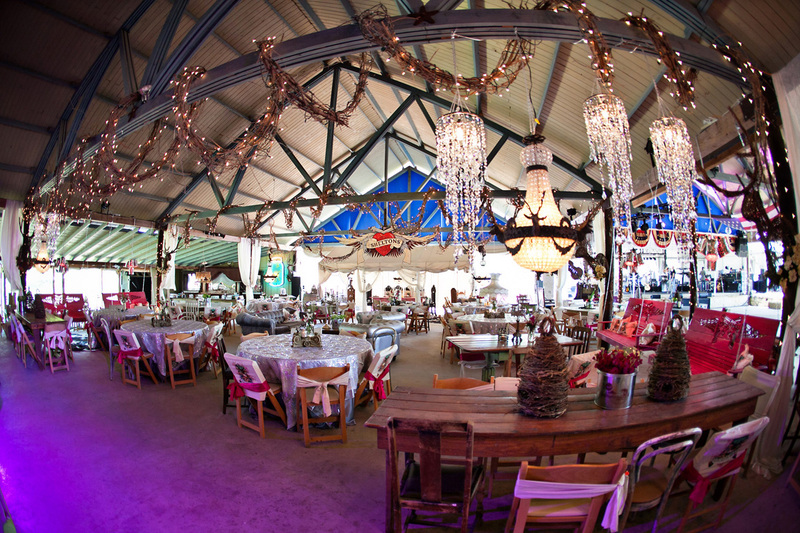 What a fabulous wedding reception! 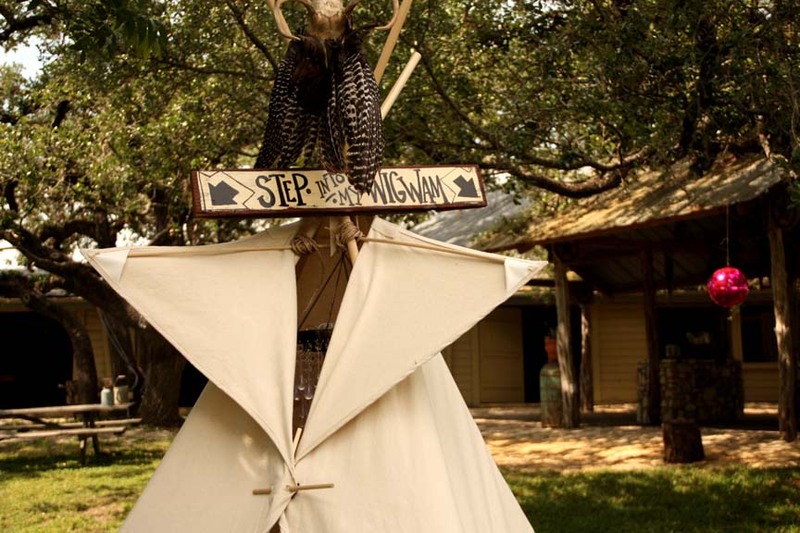 Someday I’m going to head down your way to the Junk-O-Rama prom…it’s on my Bucket List. Great job on the reception and you all looked MaRvEloUs!!! it’s definitely a bucket-list worthy TRiP!!! XOXXO!